When you look at the Block Lite demo you will see how the theme works well with visual content. The theme takes your latest posts and displays them as large blocks on the homepage with the featured images really standing out. This makes the theme a good choice for photo heavy websites. The full screen hero area looks good too as long as you have suitable, high quality images to put there. Block Light has a few simple options to change things up using the Customizer. You can change a few colours and change the header image or add a video in the hero area. You can also change the alignment of the logo and navigation. That’s all you get in terms of options so if you are expecting to be able to change the look of the theme significantly then you may be disappointed. I think fewer options are a good thing for beginners though as there is hardly anything you need to set up. This theme looks good right out of the box. Block Light has been built to work well with Gutenberg, the new editing experience coming to WordPress soon. This is good news as it means the theme is ready for the big changes to WordPress that are right around the corner. If you’re not sure what Gutenberg is yet, you can read more about it on my Theme Buyers Guide to Gutenberg post. Blocks Light has no advanced features but the pro version of the theme has lots of extra widgets and shortcodes. When you look at the Blocks Light demo you will see all these features in the demo but none of them actually come with the free version of the theme which could be annoying if you were expecting them. If you want these features they will cost you $69 to upgrade the theme. 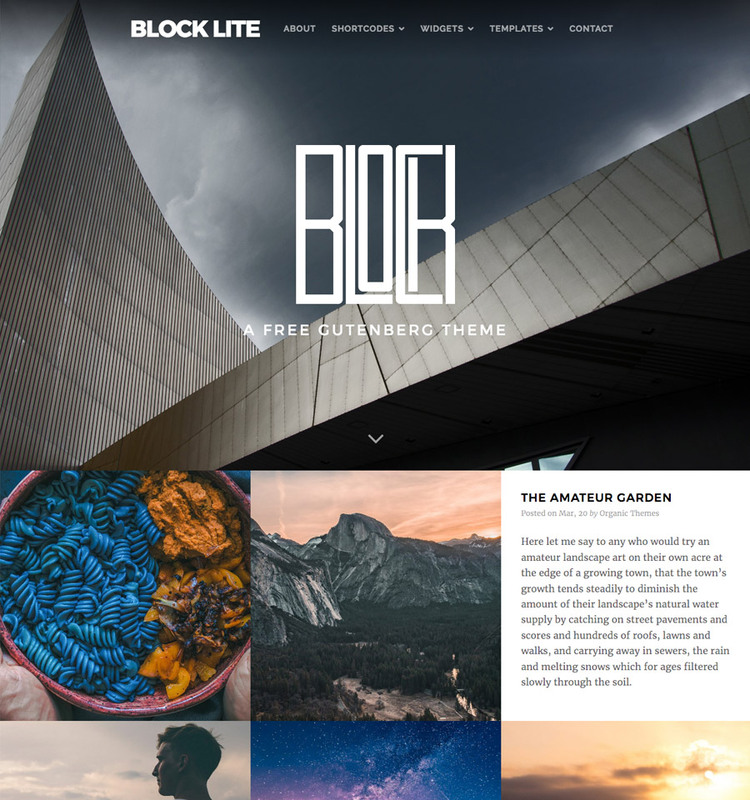 Block Light is a good choice if you’re looking for a very simple, easy to set up WordPress theme that works well with Gutenberg. The theme will work best for websites with lots of visual content. Blocks Light is created by a trusted theme provider too, so you can be sure that the code quality is good.